Savvy business owners know how valuable Google reviews can be for their business. Google reviews are a marker of trustworthiness and legitimacy. As we’ve covered before, of course you want high Google review aggregate scores. However, a negative review here and there is not the end of the world. 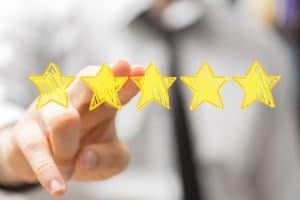 If you haven’t already done so, you should adopt the practice of requesting that your clients leave you a Google review. It can also help your online reputation to build your review scores on other, industry-specific rating platforms as well. As your clients leave you these additional reviews, do they need to vary their content? As you expand the number of review platforms that you encourage your clients to use, they may want to simply copy and paste their original review for each new site. This practice makes it easier for your clients to help you out, but should you worry about the duplicate content circulating across these sites? If you stay up-to-date on your business’s SEO, you may know that duplicate content on your website is discouraged. Do duplicate reviews from clients fall into this category as well? In short, no, because the you are not responsible for the online activity of your clients. If they are creating duplicate content on your behalf, your search ranking won’t be penalized. Do Google Reviews Really Affect Your Search Ranking? Search engine optimization is a practice based on experience and ever-changing guidelines. Google isn’t always totally transparent about how search ranking factors are determined (with good reason), and those factors can change over time. Google values trustworthiness and authority in its search rankings, and those are qualities that can be built with Google reviews, and reviews across other platforms as well. You don’t need a 5.0 ranking to show up at the top of search results. More importantly, you need a variety of real voices verifying the legitimacy of your services. While receiving duplicate reviews doesn’t violate Google’s search ranking trust, paying for reviews, or creating fake reviews under ghost profiles does. Again, the real value in online reviews is that they build the credibility of your business. If you violate that credibility by faking reviews or paying for them, you’re going to be penalized, and in some cases, face legal action. Focus on getting your real clients, who really appreciate your service, to leave authentic reviews for your business. MDPM Consulting is a digital marketing firm that specializes in dental practices. That means that our tools, tips, and strategies are catered to this industry, and based on years of specific experience. Our team can improve your website SEO, encourage your clients to leave you reviews, and build your social media presence. Learn about all of our team’s services by contacting MDPM Consulting in Dallas, TX at 972-781-8861.